What a stunning red beauty, this dragonfly of the Orthetrum species is! Actually I was at my kitchen sink doing my wifely duty preparing for lunch, and gazing outside through the window panes, I caught sight of this red creature plying behind. As you’ve guessed, I ran for my camera which was close by and hurried to where it was, probably took me half a minute in all. 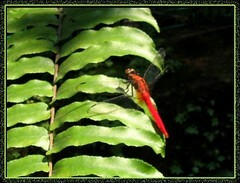 And, was I elated when I saw it was still perched on the Boston fern that spanned across the monsoon drain! It took flight when I neared him but reverse course and came back as if wanted to be photographed. :) I did a quick take of 2 shots before it flew off from my sight! How happy I am to have succeeded in nailing its identity through google search! To my surprise, this red dragonfly is a male prince, whilst the female will have a golden brown body with obscure dark markings! 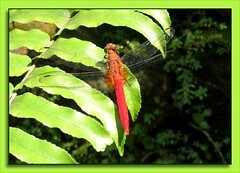 It appears to be one of the largest red dragonfly around. Location: Found in China, Hainan, Taiwan, Vietnam, Thailand, Myanmar, Malaysia, Indonesia, Philippines. Click this site to enjoy more pictures of the Orthetrum testaceum! Here, I got to know a little about ovipositing and how it copulates! It is quite similar in looks with the Orthetrum chrysis but the latter is slightly smaller with a brownish black thorax and has a tuft of black hairs underneath the base of the abdomen, in front of the secondary genitalia.